This week, we headed to the annual Kitchen and Bath Industry Show (more commonly referred to as KBIS, pronouced "k-biz") in Las Vegas, Nevada, to check in with favorite manufacturers and see what's new for 2011. In Part 1 of our coverage from the show floor we highlight sinks made in America, granite quarried in Italy, hammered-copper sinks handmade in Mexico, and more. Welcome to Las Vegas! 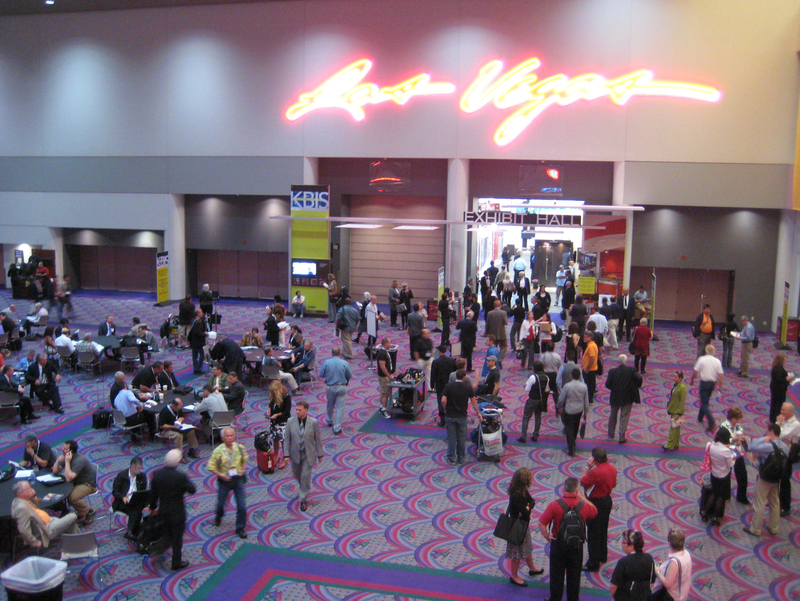 The 2011 Kitchen and Bath Show was held just off the strip in Sin City's convention center. Kohler's booth is, traditionally, one of the largest—and most impressive—at the show, and this year was no exception. Toobi was one of the latest introductions. This faucet has a customized, colorful rubber liner, offered in black, white, and spring green, which is easy to switch out if you feel like changing up the color scheme in your domestic restroom. Side note: One thing that's strange to get used to seeing at KBIS? Running water. It's EVERYWHERE. And while they pump the same stuff through, it's still difficult to resist going around and turning off absolutely everything. Kohler put its made-in-America and recycled-content cred front and center with plaques reminding attendees of its Wisconsin roots and 80-percent recycled materials in some products. One of my favorite booths this year was by DuPont. Rather than displaying panels of their new surfaces, the company featured a series of vignettes featuring its Corian and Zodiaq materials. Here is the new Corian color Hazelnut. Another vignette in the Dupont booth featured the company's Zodiaq surface in Sage. The sink is one of my favorites from Blanco, which includes a cutting board with a colander underneath so you can chop vegetables, slide them into the colander, and rinse them without making a mess of the counter or sink. California-based company Native Trails displayed its new 2011 collection at the show. Founder Naomi Neilson Howard founded the company after a trip to Mexico where she learned about hammered-copper bowls and met the artists who make make them. The company is known for its copper sinks but has also begun offering vanities and other accessories. Shown here is the Bordeaux Wall Mount vanity from the new Vintner's Collection. The vanity is made from discarded wine barrels and the collection also includes others made from used wine staves. Check out Native Trails at this year's Dwell on Design conference in Los Angeles June 24-26. Many of the kitchens in our special 100 Kitchens We Love issue featured products from Hafele. We swung through the booth to see its wares on display, such as the Moovit Double-Wall Drawer System shown here. Brizo showed its Solna kitchen faucet that featured a hidden pull-down faucet head. The company's swan-inspired Vuelo kitchen collection and art deco Charlotte bath collection was also on view and will be available this fall. Among the many quartz and acrylic surface manufacturers at KBIS, Antolini Luigi stood out visually with its solid granite surfaces. The company showed new stone cuts and incredible colors in polished and matte finishes (the latter of which the company calls "lether"). Check back for parts 2 and 3 of our trip to the 2011 Kitchen and Bath Industry Show.